Somehow it’s already Thanksgiving week, and my brain can’t quite register it! This year has flown by, y’all. And believe it or not, Christmas is coming. So that means it’s time for a gift guide!! This year I wanted to focus on smaller businesses rather than big corporations, so you won’t be finding any affiliate links here today. I love supporting small and local! All of these businesses are also run by women! That makes me even happier to support them, because nothing is better that a woman stepping into something she feels called to do. Check out my top picks, and then make sure you scroll to the bottom for a GIVEAWAY! One person will when an item from each of these shops! This shop has the most beautiful journals that would all make perfect gifts. 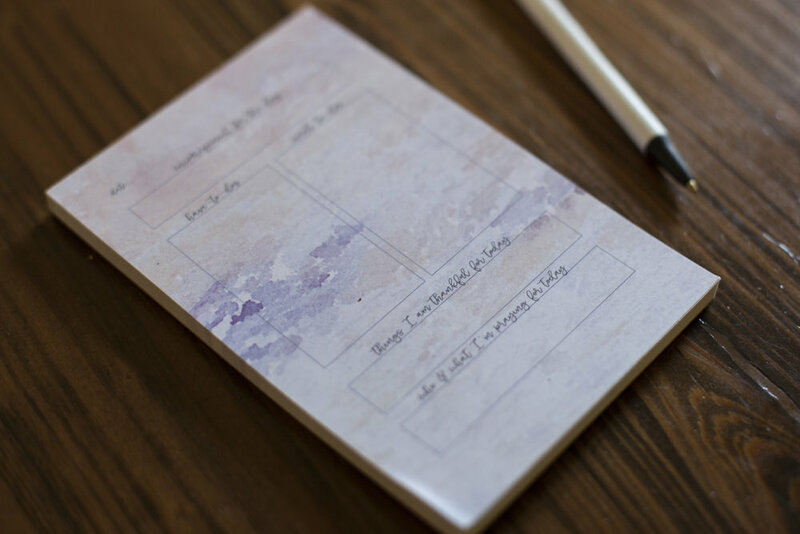 The Motherhood Journal would be such a thoughtful gift for any new mamas in your life. It’s a three year journal, with prompts and lined pages for each week. The Me+You Journal is a correspondence journal that encourages hand written letter writing and story telling. There are so many ways to use this journal! The Heirloom Recipe Journal is another great gift, one that could be perfect for your mother, MIL, or grandmother! I think it would be a sweet newlywed gift as well. It’s a journal you use to compile your favorite recipes, along with any stories and history behind them. Be sure to check out the lunch box love letters as well! I can’t wait to use these in the boys’ lunches! *Use the code THANKFUL from Friday at midnight through Monday 11/26 for 25% off your entire order. I’ve never seen such a practical but also stylish and classic apron until I found Leisure Lane. 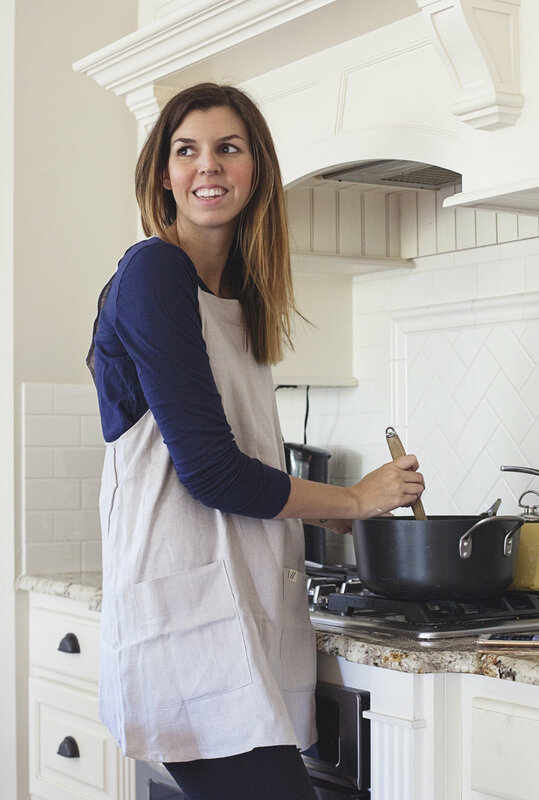 Their aprons are “made for the cook, the home keeper, the farmer, the fashionista, the artist and the little people in our lives.” The Crossback apron is so versatile and simple to put on, and it’s made with high quality and carefully sourced materials. I love the neutral colors and the linen fabric. It’s very easy to put on - no string attached! There are even aprons for your littles (junior and mini sized) - because we know they like to help us out in the kitchen! You could easily pair this with the Recipe Journal mentioned above to make an incredibly thoughtful gift. *Be on the lookout for 15% off you order Black Friday through Cyber Monday. I have been slightly obsessed with Dear Mushka’s jewelry for a while now. Gifts with meaning behind them are my favorite! Every piece is inspired by scripture and comes with a verse card. The Eclipsed locket would be such a sweet gift, especially if you include a special picture inside for the recipient. The verse that pairs with this necklace is Jeremiah 33:3 - “Call to me and I will answer you, and will tell you great and hidden things that you have not known.” Beautiful, right? There are endless gorgeous and meaningful options that would make such a precious gift. *Black Friday deals will be announced to their newsletter subscribers on Thanksgiving day, so if you want to be the first to know, subscribe here! My friend Sarah recently started her business Little Chick Love Letters, where she makes the CUTEST little personalized crayons. I have gotten each of my boys’ names made and they’ll go in their stockings this year. My kids are crayon-obsessed, so I know they’re going to be so excited to get these. They are thick and sturdy, which means they won’t snap in half within 30 seconds like most crayons do. You could get them personalized, get some fun shapes, or even the entire alphabet. These are also perfect for your nieces and nephews, grandkids, or for your kiddos to give their friends. You can contact her through her facebook page to order! She ships and also has local pick-up. Skip the big chain store soaps full of who-knows-what and check out Love Life Soap Co. Their soaps are made with natural ingredients (always ethically and sustainably sourced, and locally sourced whenever possible - from local farmers, her own garden, and honey from a friend right down her street), no artificial fragrances or colors, and handmade in small batches. 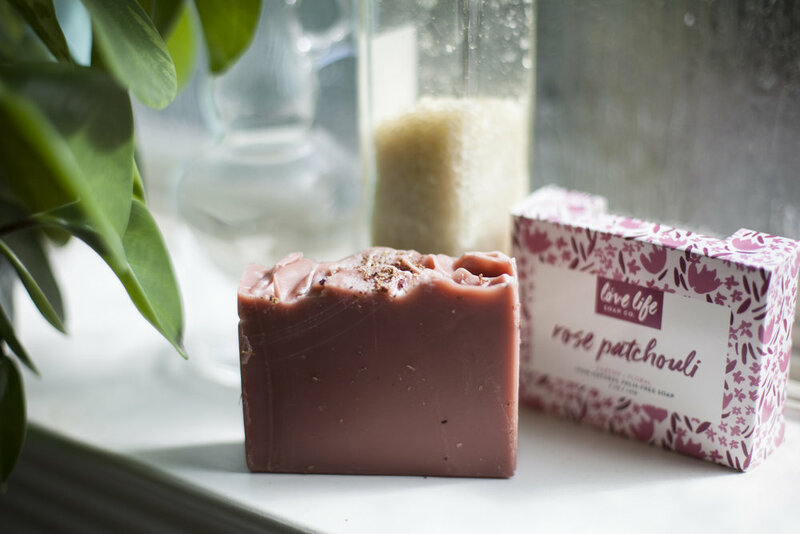 She’s got bar soaps (try the Pale Ale for hubby or dad - they’ll be excited about a soap made from beer), body butter bars, lip butters, and a soap and balm perfect for the babies - she nearly guaranteed me it has magical ingredients to help your kiddos go to sleep easier ;) ! The price point on all of these products makes it easy to stock up for teachers, friends, and hostess gifts. The gorgeous packaging doesn’t hurt either. *free shipping and free body butter bar with every order on Black Friday, no code needed! If you’ve followed this blog for any length of time, you know my love for So Yaya products runs deep. I swear by their oil cleansers and serums! They also make the best all natural mani & pedi balms that would make a sweet and easy gift! I’m thinking stocking stuffers, teachers, neighbors, friend gift exchanges! You could easily pair it with some cozy socks or your favorite nail polish if you wanted. Get the mani/pedi set or buy them separately: mani balm, pedi balm. *They’ll be offering free shipping through the holidays as well as some sampler gift sets! I can’t leave my own shop out of this list, can I?? Check out the Cold Coffee Shop for a lot of fun options to gift this Christmas! I’ve got notepads and mugs that would make great teacher or friend gifts, as well as art prints! Art is something everyone can appreciate, and it is one of my favorite things to gift. Be sure to check out original artwork I have available, or commission something special with me at Hannah L Fine Art! *I’ll be offering 25% off in the Cold Coffee Shop from Black Friday through Cyber Monday with the code THANKFUL25. And be sure you’re following along with Hannah L Fine Art on Facebook and Instagram for some deals as well! Need more ideas? Check out the 2017 Gift Guide here. And be sure to check back to this post for Black Friday, Small Business Saturday, and Cyber Monday deals. I will update the post with info and discount codes accordingly. two bars of soap from Love Life Soap Co. The * denotes required for entry, others are optional for extra entries! Be on the lookout for my posts on Instagram and Facebook for even more ways to enter! Giveaway will run until November 27th. I will contact the winner and get their info on where to send the prizes! Happy shopping, friends! Special thanks to each of these shops for sending items to me to able to give my honest review and recommendations, as well as items for the giveaway. I get asked a lot about how I got started with my blog. The truth is I just did a lot of googling. A LOT. If there's something you want to know out there, google it and I promise someone has written an article or made a video about it. There's everything from how to get a website domain to how to insert a link in your post. I mean I've googled some crazy things and I've always found the answer. But sometimes that sort of thing can get overwhelming, so today I'm rounding up some of my favorite resources I've found that have done the practical work of telling me how to start a blog and the things I use to "continue my education" as well as encourage and inspire me. If you need help just getting started, you need to get Natalie's Blogging Course. This course is perfect if you've finally decided to start your blog and you don't even know what to do first. It starts with the basics of choosing and getting a domain and website hosting and also covers everything from how to create content to how to earn income with your blog. There's also a private Facebook group for everyone who has taken the course. 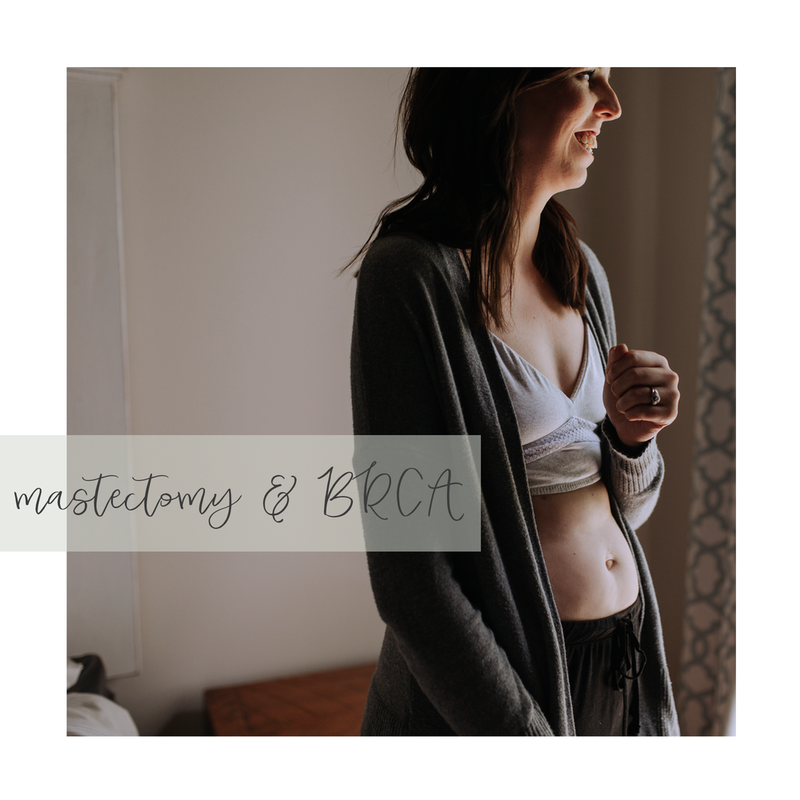 It's such a good resource to connect with other bloggers, ask questions, and there's a monthly live Q&A. Natalie is now one of my real-life friends and she is the real deal, y'all! She is very passionate about helping others succeed with their blogs. This course is 100% worth the cost. The only thing I have done different than what the course covers is that I use Squarespace instead of Wordpress. I used Wordpress for a while, but I find Squarespace to be much simpler and much more user friendly. I'm really glad I switched over!! Squarespace and Wordpress have some pre-built templates that you can use, but there are other ways to customize the look of your site so it fits you perfectly! If you can afford to hire someone to build and design your site then that's a great option to get a site that looks exactly how you want (my site and brand were designed by Magnolia-Ink). But I know a lot of us starting out are on a budget, right? For my first site design I found a template I loved on Creative Market. I LOVE Creative Market and use it pretty frequently. There are website templates, fonts, social media templates, media kit templates...you get the idea. It's a great way to add customized items to your brand before you can dive in with something fully custom. Another great tool for creating custom images and graphics is Canva. Canva is free to use and has thousands of templates to help you create logos, graphics for your blog and social media, PDFs, you name it! This is a great option if you don't have something like Photoshop or Illustrator. Canva also has a free app so you can easily create content from your phone. Other resources/apps I love for creating graphics and editing photos: Unsplash.com for finding beautiful (and free!) stock images, Word Swag (for graphics); Afterlight, Snapseed, and Color Story for photo editing. Color Story also has a grid feature that helps you plan out your Instagram feed. Planoly is a great app and site for planning out your feed and content. Another great option is Loomly. You can use Loomly to schedule your social media content, but what makes them unique is they focus on the entire content creation & collaboration process, instead of just the scheduling part. Podcasts are the easiest way for me to learn new tips and ideas about creating content and growing my blog. I can listen while I drive, while I clean, while I paint, etc. These are all of the ones I listen to regularly and have learned a lot from! I'm not providing direct links since not everyone is an Apple user, but you can search for and listen to these on whatever podcast app you have! The Goal Digger Podcast by Jenna Kutcher. She is such a motivator and encourager, and this podcast is packed with very tangible info and tips on how to grow your blog or business. 3 episodes to start with: 129: Ask Jenna Anything...About Social Media, 111: How to Find Your Secret Sauce and Stand Out in a Crowd, 103: Want to be a Social Media Influencer? Here's how! 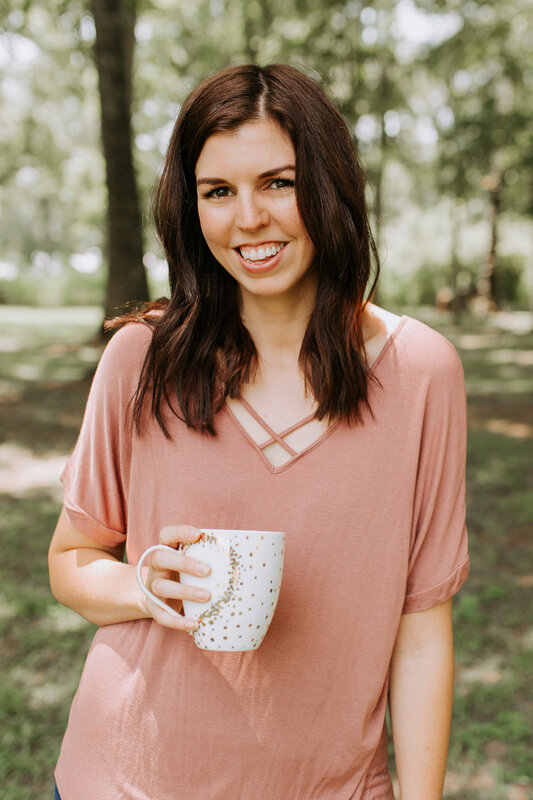 Rise Podcast with Rachel Hollis. Y'all know my love for Rachel Hollis runs deep. This podcast is no exception. This podcast has tons of interviews with phenomenal women, and some solo episodes. I have learned SO much from listening, and also been very inspired in both business and my personal life. 3 episodes to start with: Steps to ACTUALLY Achieve a Goal, How to Start Vlogging in 2018 (a lot can apply to blogging too), Turning a side hustle into a multi-million dollar business (interview with Erin Condren). The Influencer Podcast with Julie Solomon. This is another great one for lots of tangible advice. She talks about specific topics as well as shares interviews with successful women in the influencer world. Julie is not stingy with her advice and tips, and each episode is packed with info you can start putting into place. 3 episodes to start with: 048: Is Blogging Dead + How to Grow Your Instagram Following in 2018, 018: Instagram Basics: Tips to Networking Without Being Fake, 008: Turn Blogging and YouTube into a Mega Business with Angela Lanter. Christy Wright’s Business Boutique. Christy's podcast is mainly geared toward women starting and owning businesses, but a lot of it still applies to blogging. She is honest and so funny, and helping women succeed is her passion! 3 episodes to start with: Mom Entrepreneurs: Finding Success in Business and Motherhood, Episode 40: Top Traits of Highly Successful Women, Episode 11: How to Make the Most of Social Media. Awesome with Allison. Allison's podcast is more of an encouragement/motivation podcast, but those are a huge foundation in having success with your blog or business. She's so honest and raw, and insanely motivating. You need to be following her on Instagram for sure, because she has the most amazing dance moves. She also hosts workshops for branding, so that is another thing you can check out! How I Built This with Guy Raz. Listen to this one to get inspired by some of the most successful entrepreneurs on the planet. They share their stories of how they started their companies - the good & the bad (because there are always failures, but that's the only way to get to success). 3 episodes to start with: Kendra Scott: Kendra Scott, Barre3: Sadie Lincoln, Spanx: Sara Blakely. Last but not least, I have a pinterest board where I save blogging tips and ideas if you're interested in following that as well! I hope these ideas and resources will help you get started or grow what you've already started. I'd love to chat with you about your blog if you ever have any questions. Leave a comment below or shoot me an email! Could a blog for moms even be complete without a Mother's Day Gift Guide?! Guys, I'd love to say I'm one of those people that rolls my eyes at holidays like this, but I'm just not. Being a mom is the thing I'm the most proud of, and it just makes me feel good when there's a day set aside to celebrate that! I love that there's a day to intentionally tell my mom and all of the amazing moms that I know how awesome I think they are! But real talk, am I the only one who wants to have zero of my normal "mom responsibilities" on Mother's Day??! Like, I'll hug and kiss my babies, but I'm gonna need someone else to change the diapers and fix the meals, ok? Anyway, let me get back to why you're here: a gift guide. I wish gift giving was my love language, but I am a person that tends to get overwhelmed with choosing the perfect gift for someone. So I've made it my mission to help you (and me) out by narrowing it down to some pretty fantastic and unique gifts. These will work for your Mama, your Mother-in-Law, your mama friends, or if you want to just forward it on over to your husband, you go right ahead girl. Enjoy shopping! Let me know in the comments if any of these make their way to your cart, or if you'd add anything else to the list! Art always makes a great gift, especially art that inspires. I have this print from Lindsay Letters hanging in the hall outside of the boys' rooms and I love it so much. I've also gifted the print to both my mom and my Mother-in-Law. It's such a sweet reminder of what a gift our children are. Lindsay Letters has so many beautiful prints to choose from - I have quite a few in my own home. A painting or framed photograph are also great gift ideas. Does this even need an explanation, y'all? A fancy box of chocolate is always a win. I currently just keep a bag of dark chocolate chips in my pantry - the opposite of fancy. So a beautifully decorated box filled with gourmet treats would be so special to receive! This three year journal is absolutely beautiful, both in design and content. The layout is clean and simple, giving space to reflect on each week. It's a space where mamas can reflect on the highlights of their week, as well as their hopes and prayers. What a treasure it would be to look back on through the years or hand down to your children one day. I think this would make such a sweet and thoughtful gift! Be sure to check out their Me+You Correspondence journals as well. Jamie has graciously offered us a code for 15% off that will run until May 6th (the last day to place your order in time for Mother's Day). Use code CCHM15 at check out! These cute bamboo clutches are so on trend right now. I think they are appropriate for any age, so if you're shopping for your friend, your mom, or yourself, one of these cute bags would be the perfect fit! How adorable are these earrings?! These are handmade by one of my dear friends. She's so talented and has great style. Check out her facebook page for lots of different designs - from leather to tassels to feathers! A beautiful comfy robe is a gift you can't go wrong with! There are a ton (over 500!) of rave reviews on this one from Barefoot Dreams. There are quite a few color options, which I love. I know it's a bit on the pricey side, but for something you would use every single day, I think a little bit of investment is worth it. I also found this more budget friendly one from Amazon that has great reviews as well! I don't think I've met many women who don't appreciate a nice hot bath! Help a mama out and give her a treat to help make that bath even more relaxing and pampering. This bath soak from Indie Lee can be used to detoxify skin, improve circulation, relieve aching muscles and deliver softer, more supple skin (um, yes please!). The price point is great so you could easily pair this with a nice bath robe like I linked above, or some other pampering supplies like a good body butter! I have been drooling over the jewelry from Dear Mushka for so long now it's ridiculous. One of my favorite pieces is the Essential Necklace. All of their jewelry is inspired by scripture. This one points to Micah 6:8 - "And what does the Lord require of you but to do justice, and to love kindness, and to walk humbly with your God?" This simple necklace calls us back to these basic directions. I love giving a gift with meaning, and every single thing from Dear Mushka is packed with it! Here are a few that are more specifically designed for moms: The "Called" necklace is one you can personalize with special initials or numbers. The "Quiver" necklace has an arrow to represent your children, and you can add multiple arrows if you want! Shopping for an adoptive mama? The "Together" necklace was designed especially for her. Forgive me for jumping from a beautiful and meaningful gift to a wine cup. BUT who doesn't need a great cup for their wine?! These insulated cups won't break and keep your wine at the perfect temperature. I think that's a pretty darn thoughtful gift! Pair it with a bottle of her favorite wine! Any Chip & JoJo fans out there? All of you? That's what I thought. The new cookbook from Joanna Gaines would make a great gift for anyone. Pair it with a cute apron, a handmade serving board, or these cute cooking utensils from Target. This straw tote from Vera Bradley is basically one of the cutest things I've ever seen! It can be used as a great spring & summer purse or as a beach tote. Gift it on its own or pack it with a few essentials like a cute water bottle, a beach towel, a magazine, and some sunscreen and you've got a great gift! A candle is always a great and easy gift! Everyone loves them! And this lemon and sea salt scent is perfect for spring and summer. While a gift card to go get a mani & pedi makes for a great gift, if a mama in your life doesn't mind a little DIY, this at home gel nail set would make an awesome gift! I have a light and polish set that I use on the regular. It's so convenient and saves so much money! This is a starter set but you can purchase other colors almost anywhere that nail supplies are sold. I shared about Covered. on my Holiday Gift Guide. Her bracelets are just so beautiful that I had to link them again. The quality is top of the line, and the price point is great! She adds new designs all the time so I'm sure you'll be able to find something you love. She also carries some other great accessories, so go check her out! Last but not least I have to mention one of my favorite shops, SFT. 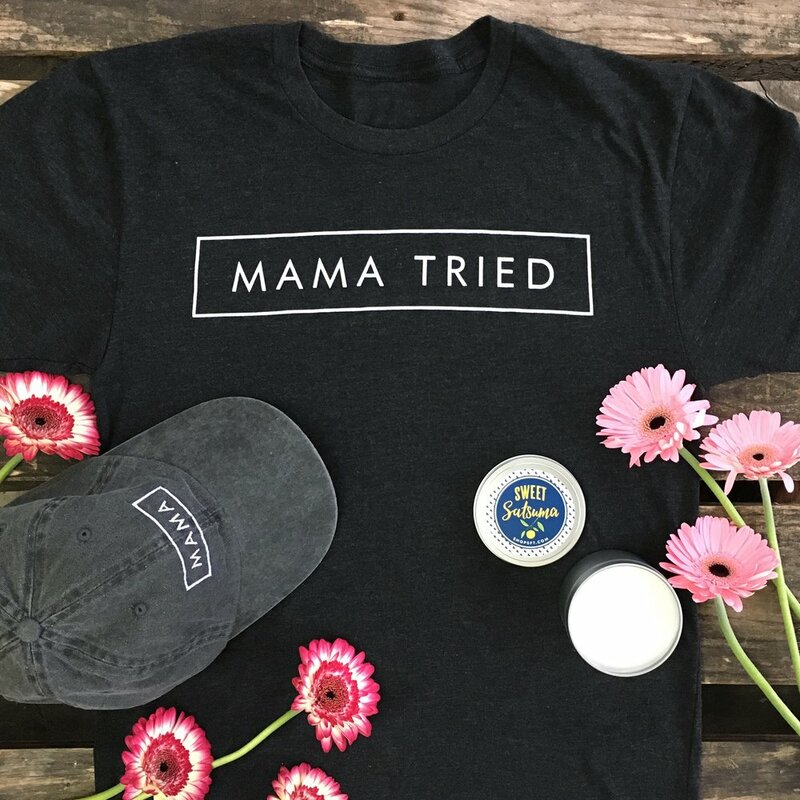 Each month they put together a subscription box called the Lagniappe Box, and this month they have created one just for Mamas! I always get questions when I rock my favorite "Mama Tried" sweatshirt. Since the weather is heating up, this short sleeved version, along with the super cute Mama hat, are a perfect pair. The Satsuma candle also smells amazing! This would be such a fun box to gift to someone, or to yourself! I hope this list was helpful and gave you some good ideas! Let me know if you decide to get any of the things I have shared, and if you have any other great gift ideas I'd love to hear them in the comments. I know the other readers would benefit from all the great suggestions I know y'all have as well! Cheers to you, mamas! Enjoy the day that's just for you! Some, but not all, of the items linked here are affiliate links. We love stocking stuffers and we love keeping them simple. It's always hard to find ideas for fun things to add to everyone's stocking that don't cost too much. We like to keep stocking stuffers under $30 because otherwise, we feel like you're getting into the "gift" category. Growing up, stocking stuffers were always fun trinkets, chapstick, candy; basically nothing too extravagant. So, we tried to make our stocking stuffer guide intentional while also being fun and a little practical too.